Asthma puts you at risk for high blood pressure and premature birth in pregnancy, as well as problems with the placenta. 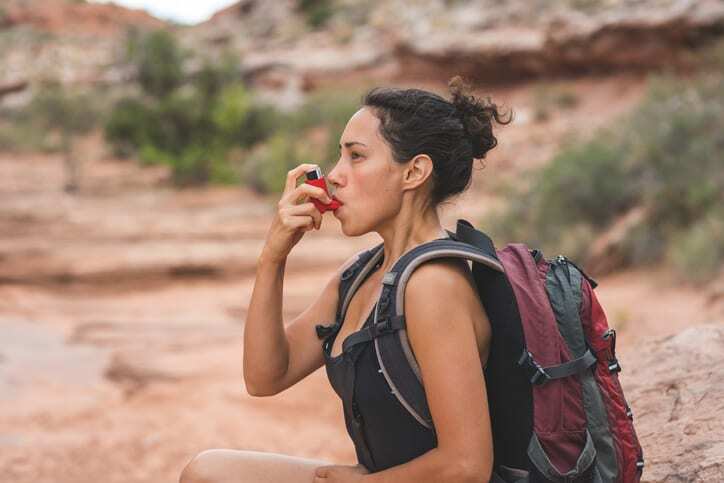 “Just relax and breathe easy.” We hear this all the time but if you’re one of the 20 million Americans—that’s 1 in 15—who suffer from asthma, breathing is anything but easy. With asthma, your airways react to triggers like allergens or irritants and swell. As you struggle to move air in and out of your lungs, you may gasp, wheeze, cough and feel tightness in your chest, say the experts at the Asthma and Allergy Foundation of America. Left untreated, asthma can be deadly. Asthma affects people individually; you will need to work closely with your healthcare provider to manage it. Read these FAQs to learn how to protect your health now and in pregnancy with asthma. If I’m diagnosed with asthma, can’t I just take a medication to cure it? No, you can’t cure asthma but you can manage it. First, avoid the triggers that cause your airways to react, say experts at the CDC. Common triggers include tobacco and second-hand smoke, outdoor allergens like pollution, and indoor irritants like dust mites, pet dander or mold. Viral infections can trigger an attack, as can breathing in cold, dry air or strenuous exercise. You can control asthma with fast-acting inhalers and oral medications that reduce airway swelling, but no one regimen fits all. Should I avoid pregnancy if I have asthma? No, not necessarily, but discuss your individual risks and changes you may need to make in your medications, diet or lifestyle with your healthcare provider before getting pregnant. For one-third of women asthma improves during pregnancy, for one-third it remains unchanged, and for another third, it gets worse, says the National Institutes of Health (NIH). Asthma puts you at risk for high blood pressure and premature birth in pregnancy, as well as problems with the placenta. Because asthma restricts oxygen flow, your baby is at risk for lower birth weight. The risk of birth defects from asthma medications during pregnancy is very low (less than 1%) especially in contrast to the health risks of not controlling asthma. Will I give my baby asthma if I have asthma and become pregnant? Maybe, as there is a genetic component to asthma. The chances are 1 in 3 that if you or your partner has asthma you will pass it along to your child. If you both have asthma, those chances increase to 2 in 3 that your baby will have asthma, says the NIH. This is particularly true among premature babies. For example, experts know premature babies are at greater risk for breathing problems after birth. Those problems can sometimes last through the school years and into adulthood. Asthma is the most common medical complaint among adults who were born premature. The CDC reports that asthma triggers can include tobacco smoke, mold, outdoor air pollution, and colds and flu. Doctors and patients can better manage asthma by creating a personal asthma action plan that the patient follows.